These three verbs can be used further to refer to the giving and receiving of "actions" (deeds). They indicate who is doing that act for whom, while also expressing a sense of goodwill or gratitude. In this case, the act is expressed by the て-form. 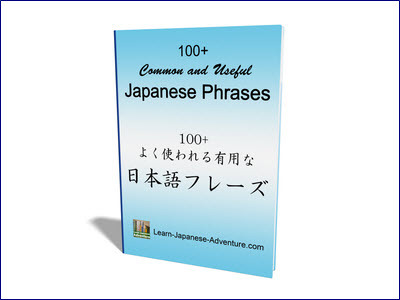 Let's first recall the sentence patterns of あげる (ageru), もらう (morau) and くれる (kureru). As discussed in basic lesson 20, from a Japanese's point of view, he/she always shows the respect to other people (third person) first, followed by his/her own family members (even those who are younger than him/her) and lastly the speaker himself/herself. 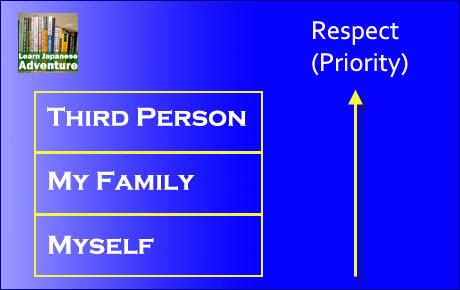 The picture below depicts this concept of respect given towards third person, one's family and oneself. While もらう (morau) sentence focuses on the Receiver (being the subject of the sentence), the focus is on the Giver (subject of the sentence) for both あげる (ageru) and くれる (kureru) sentences. Also from basic lesson 20, the table below shows whether to use くれる (kureru) or あげる (ageru), depending on whoever is the Giver or Receiver. When you have to show respect to ONLY the Giver, use くれる (kureru). 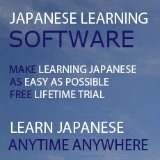 Otherwise you have to use あげる (ageru). For example, you use くれる (kureru) when someone (third person) gives something to you or to your family members, OR when your family members gives something to you. Understanding the above basic concept of あげる (ageru), もらう (morau) and くれる (kureru), let's move on to learn about the giving and receiving of "actions" (deeds). In this case, the Giver is doing something (action) for the Receiver instead of only giving something (object). Meaning: I showed the photos to my family. The above sentence is just a fact that you've shown the photos to your family. There's no personal feeling contained in the sentence. If you want to show that your family (Receiver) is grateful for your action, change the sentence by using ～てあげる (~te ageru). In the above example, the Giver (action taker) is the speaker (私). The receiver is the family (家族) and the family feels grateful for what the speaker has done (showed the photos). The meaning of the sentence is exactly the same as the previous example except that in this example, the speaker thinks that his/her family will be grateful for his/her action. Verb て-form あげる indicates that one does something (by way of doing a favor) for somebody with a sense of goodwill. When the speaker is the action taker and the listener is the receiver of the act, this expression could give the impression that the speaker's act of doing a favor is forcing an unnecessary help upon the beneficiary. You are, therefore, advised to avoid using this expression directly to someone whom you do not know very well or who is senior or superior to you. You may use it on someone with whom you have a very close, friendly relationship. Meaning: Mr Kimura lent Mr Tanaka an dictionary. The subject of the above example is Mr Kimura, which is also the Giver of the act. Verb て-form もらう indicates that "Somebody kindly does something for me" or "I have somebody doing something for me". This expression conveys a sense of gratitude on the part of those who receive a favor. Meaning: Ms Yamano taught me Japanese (and I feel grateful). 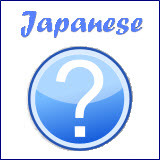 The subject of the above example is the speaker (私), which is also the Receiver of the act. Verb て-form くれる indicates that somebody does a favor for me. This expression also conveys a sense of gratitude on the part of those who receive a favor. The difference is that Verb て-form もらう has the Receiver of the act as the subject of the sentence, while Verb て-form くれる has the Giver as the subject of the sentence, implying the giver (the subject) voluntarily takes the action. The receiver of the act in the latter case is often the speaker and "私 (the receiver) に" is often omitted. The subject of the above example is Ms Yamano, which is also the Giver of the act. The "私に" in the bracket  is often omitted. In the next lesson (part 2 of giving and receiving of "actions"), I will demonstrate how to use ～てあげる, ～てもらう and ～てくれる with many different examples. You will also learn what are the particles used depending on the verbs in the examples.